What a week. I’m in Pigeon Forge Tennessee for the Imagination Library conference. I’ve been to each of the conferences for ten years (they are held every other year). This has been the best one yet. 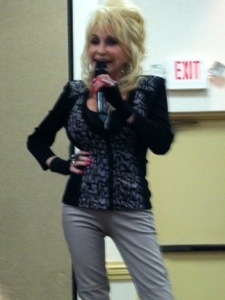 Dolly Parton has been at each of the conferences. In fact, at the very first one in 2003, I was selected to make a presentation to her. She is pretty protected and even though she is here, we don’t get to talk to her. But I did that year. Wow! Amazing how different I look in ten years! Anyway, it was a bit disappointing to learn she would not be available to be here this year. The first night I was able to meet someone actually shorter than me. 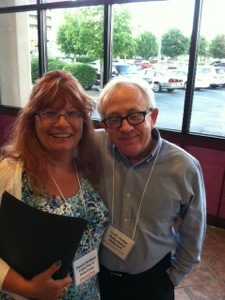 Leslie Jordan allowed himself to be photographed with me. Not a great picture, but you get the idea. Then, we really did get a special treat on Wednesday. Again, my pictures weren’t great. Our special guest today was MoMo. 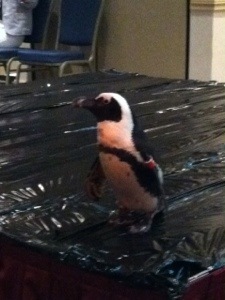 She was visiting from the Ripley’s Aquarium from Gatlinburg. She was here to help with the book signing with Toni Buzzeo, author of One Cool Friend. All in all, it’s been a great week. I’ve learned a lot. I have a lot of new ideas. 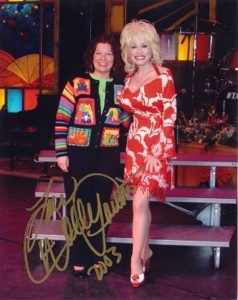 I’m not staying for the morning session at Dollywood. Time to head home. Thinking I need to stop at one or two wineries on my way home. I’m thankful for learning from colleagues.